The Protein Extraction & Lysis Buffer (PE LB™) systems ensure good protein recovery, while maintaining the biological activity of the proteins. The solubilized proteins are suitable for enzyme assays, electrophoresis, folding studies, chromatographic studies and many other downstream applications. The PE LB™ systems offer a wide selection of buffers for lysis and extraction of proteins from bacteria, yeast, animal cells and tissues. The PE LB™ systems are based on a proprietary combination of organic buffering agents, mild non-ionic detergents, and a combination of various salts to enhance extraction of proteins and maintain stability of biological activities of the proteins. 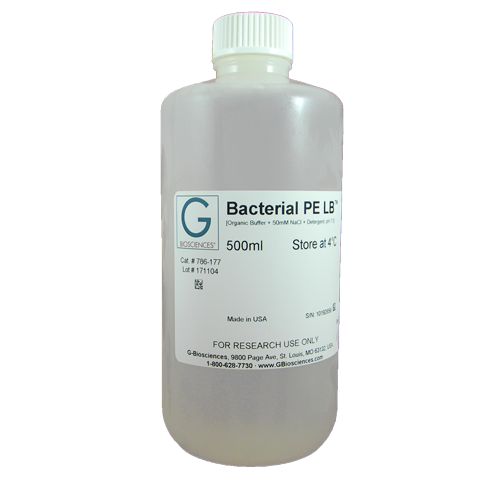 Bacterial PE LB™ has been developed for the extraction of soluble proteins and inclusion bodies from bacterial cells. It is a proprietary improvement on the lysozyme based lysis, which allows extraction of soluble proteins and concurrent removal of nucleic acids (DNA & RNA) released during..
Bacterial PE LB™ in Phosphate buffer is a variation of Bacterial PE LB™ buffers only in phosphate buffer. It is used preferably for extraction of soluble proteins and soluble recombinant proteins from bacterial cells. Bacterial PE LB™ in Phosphate buffer contains a mild no..
Insect Cell-PE LB™ has been developed for extraction of cytoplasmic soluble protein from insect cultured cells. 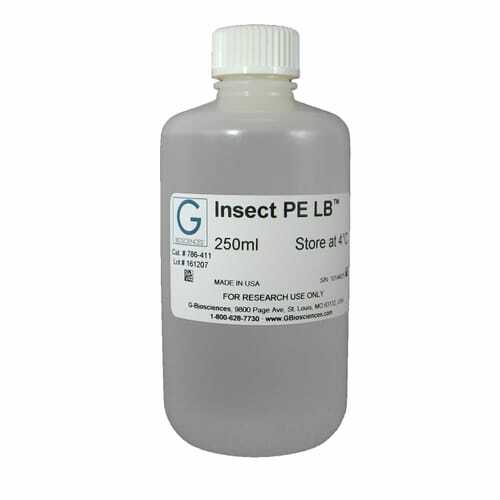 The Insect Cell-PE LB™ is based on organic buffering agents, which utilizes a mild non-ionic detergent, and a proprietary combination of various salts and agents to enhance ext..
Tissue-PE LB™ has been developed for extraction of total soluble protein from animal tissues. 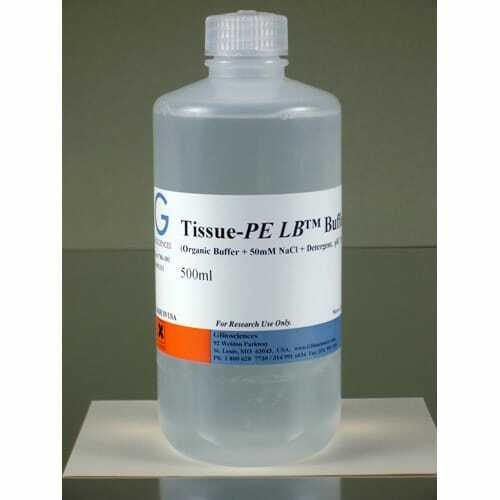 Tissue- PE LB™ is based on an organic buffer, which utilizes a mild non-ionic detergent, and a proprietary combination of various salts and agents to enhance extraction and stability of pr..
Yeast PE LB™ is useful for extraction of soluble proteins from yeast cells. 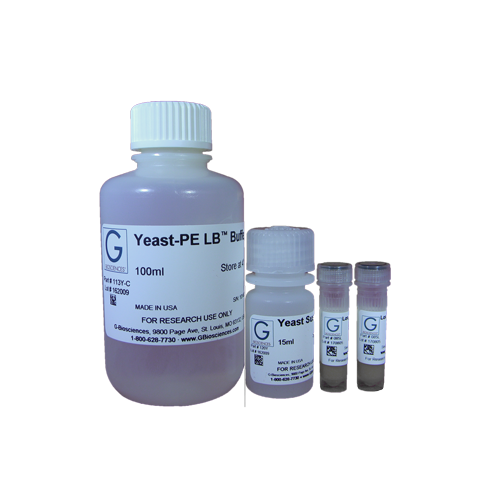 Yeast PE LB™ is a proprietary improvement on the Zymolyase® based spheroplast preparation and extraction of soluble proteins from yeast cells. This kit is provided with an optional protocol to make spheroplas..
Mammalian Cell PE LB™ has been developed for extraction of total soluble proteins from mammalian cultured cells. 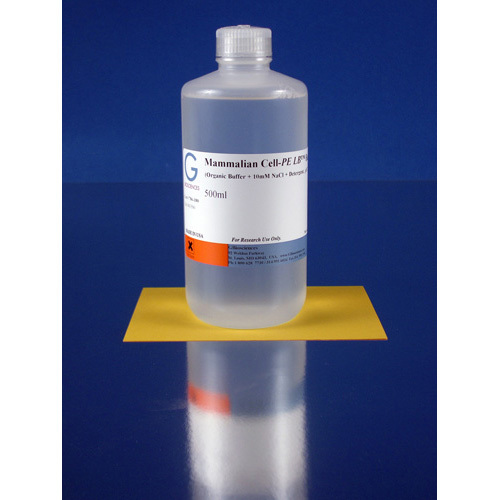 The Mammalian Cell PE LB™ is based on organic buffering agents, which utilizes a mild non-ionic detergent, and a proprietary combination of various salts and agents to enhance..